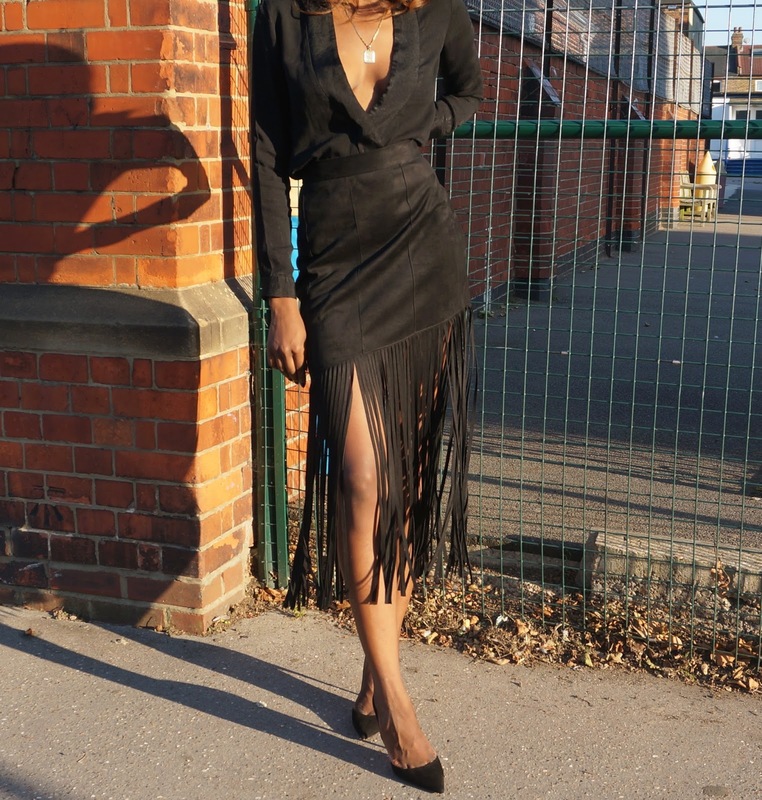 Today's post is a look at how I chose to wear the fringe skirt that picked up from Zara a couple of weeks ago. Sometimes there is a gap between when I purchase new pieces and when capture them for the blog and unfortunately on this occasion the skirt is now sold out but I have placed a link to a similar one also from Zara. I did have my eye on this particular fringe skirt for quite some time now and even featured it in an earlier blog spot on some in trend fringe skirts available in shops right now so it was a relieve to finally get my hands on it. I kept my styling very simple, pairing it up with a long sleeved v-neck blouse that I also picked up from Zara. Give the fringe detail of the skirt I feel it is best to wear clear cut simple tops so as not to distract from the fringes. For instance, I wouldn't pair the fringe skirt with a ruffle styled top because that would be competing for attention from the skirt. Therefore if you want the fringe skirt to be the main attraction piece in your outfit then I suggest keeping all other pieces of clothing to a simple design. This is a look that I will consider replicating with a few changes off course for London fashion week as it dawns upon us. Having said that I do think the fringe skirt could equally work well with either a buttoned up smart shirt or on the other hand a casual t-shirt. What are your thoughts on the fringe skirt? Would you wear it?